What is the diet for PKU? What is Included in a Low Phenylalanine Food Pattern? The diet for PKU consists of a phenylalanine-free medical formula and carefully measured amounts of fruits, vegetables, bread, pasta, and cereals. Many people who follow a low phenylalanine (phe) food pattern eat special low protein breads and pastas. They are nearly free of phe, allow greater freedom in food choices, and provide energy and variety in the food pattern. What is Not Included in a Low Phenylalanine Food Pattern? Foods that contain large amounts of phe must be eliminated from a low phe diet. These foods are high protein foods, such as milk, dairy products, meat, fish, chicken, eggs, beans, and nuts. These foods cause high blood phe levels for people with PKU. This target is an easy way to visualize the foods allowed on the diet for PKU. The phenylalanine-free formula, such as Phenyl-Free*, is the center of the target diet. 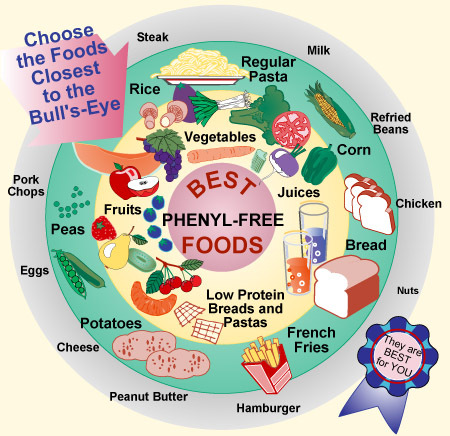 As the foods get further away from the bull's-eye, they are higher in phenylalanine. The foods outside the target are not included in the low-phenylalanine meal plan. How Can This Food Pattern be Enough? It is not unusual for someone who follows a low phe diet to have 2 kinds of vegetables and a baked potato for dinner. However, if these foods were the only foods a person consumed, his or her diet would be lacking protein, vitamins, and minerals. That is where the special formula comes in. A special phenylalanine-free formula, such as Phenyl-Free*, contains protein, vitamins, minerals and energy (calories) with no phenylalanine. With formula, a person with PKU gets plenty of protein, without the side effects of the high phe content of most foods. The phenylalanine-free formula is the most important part of the diet for PKU. How Long Must a Person With PKU Follow This Special Diet? Research has shown that this diet should be followed for life. Keeping blood phe levels in the safe range helps to prevent problems with thinking and problem solving. In the past, people with PKU were advised to stop their low phe diet when they were children. Most young people with PKU who were taken "off diet" did not monitor their blood phe levels and were not given any reason to be concerned about them. These people began to experience problems with paying attention, concentrating, and remembering. Recently, many of these same people have decided to go back "on diet" hoping to feel better. In order to go "on diet" a person must drink a special phenylalanine-free formula and choose low phe foods so that blood phe levels are in the safe range. It is never too late to go back "on diet." A low phe diet helps most young adults with PKU to feel better and improves attention span, concentration, and memory. In general, young adults who have made these changes report that they think and feel better. The effort that it takes to bring down blood phe levels is well worth it for everyone, no matter how long they have been "off diet." * Phenyl-Free is a registered trademark of Mead Johnson Co. A number of other formulas are available.